Happy, relaxing Sunday, hope everyone is having a good weekend. I’m planning to actually buy pumpkins today, I’ve been so busy the last few weekends with travel and running that I just haven’t yet and feeling jealous looking at all the cool pumpkins on display at my neighbors houses. And maybe go for a long bike ride since I’m still on run rest after last weekend’s half marathon. I tried running on a treadmill at our gym earlier this week, but felt a slight calf strain that I didn’t want to stress further. 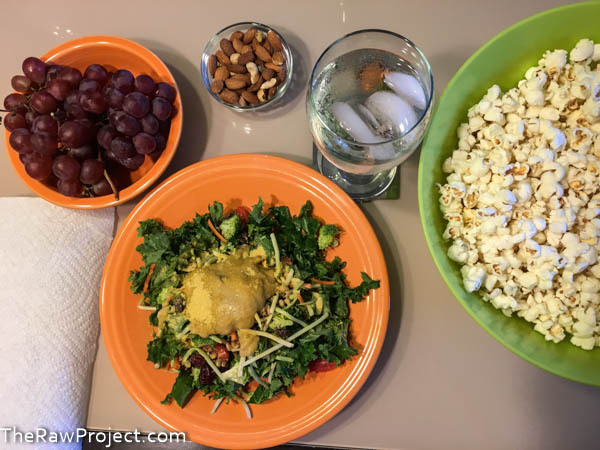 I’m still focusing on getting back to lots of whole veggies after vacation and had a great lunch with my mom during the week of kale salad, grapes, nuts, and air popped tamari popcorn. Friday night hubby and I ventured to a local pizza place that we have not been to in ages. 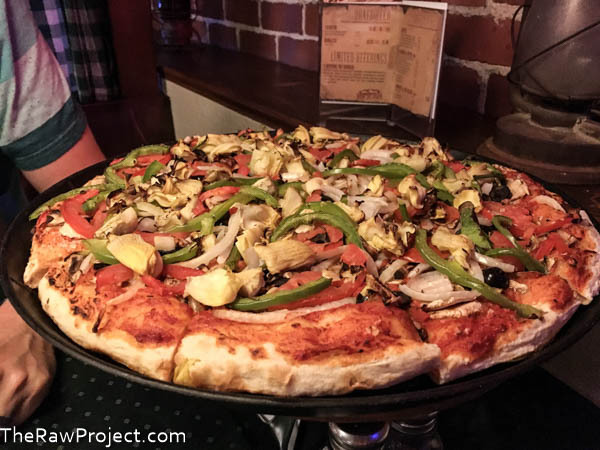 They’re a famous locally owned place in old town, but the simple menu did not include vegan options and so many new pizza places in the area do now. We decided to be daring and show there is a demand for vegan options and ended up getting a large, veggie loaded pizza without the cheese. It was good, hearty with a savory herb marinara sauce and filling. I loved all the artichoke hearts, one of my favorite pizza toppings with black olives. Plus it wasn’t greasy or mushy, the crust was nicely crusty and something we will go back for. This is going back many years ago before I was fully a vegan, probably 8 years ago now … wow, has it been that long?! But at that time we ordered a half veggie pizza for me and half meat loaded pizza for him, or the heart attack special as I called it. I remember avoiding the slices touching his side because the grease from all the meat had saturated the veggie slices too. We’ve grown a lot since those days and I’m thankful. 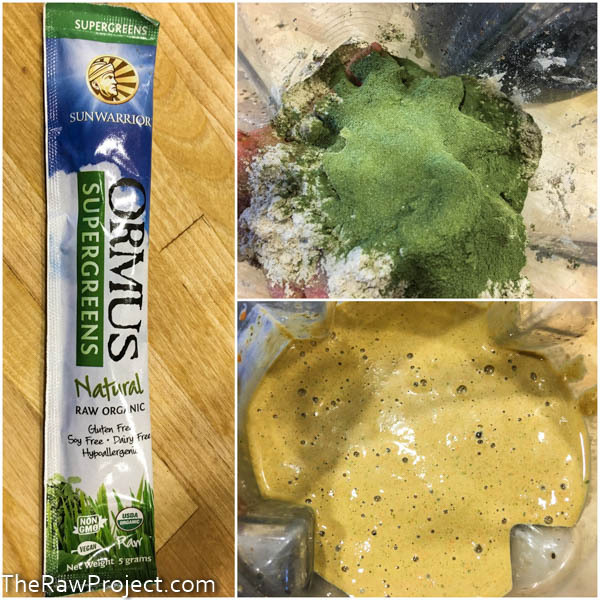 I tried another Sunwarrior product in our smoothies this weekend – Ormus Supergreens Powder. I love the concept of this product, it’s a blend of many superfoods in a fine powder form to easily up the nutritional value of smoothies. That’s great! The powder is very fine and smooth and did not make the smoothie seem earthy or gritty. The superfoods ingredients include Alfalfa, Barley Grass, Wheat Grass, Oat Grass, Spinach, Parsley, Moringa, and Ginger Root and a 45-serving jug of it isn’t expensive on Amazon, I could stretch that for 2 months while upping the good stuff in our smoothies. 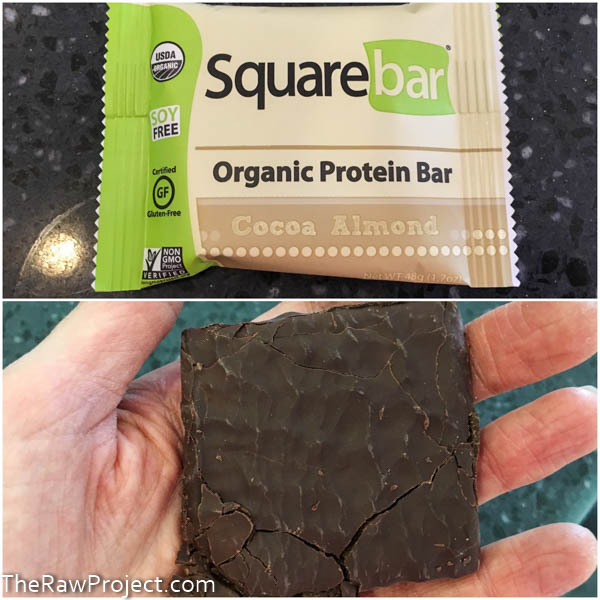 I also tried a new vegan protein snack bar – a Squarebar Organic Protein Bar in Cocoa Almond. I impulsed bought it at Whole Foods last week because they were on sale and sampling them and it came in handy yesterday as a quick lunch snack before heading to a 12:15 hair appointment. For 220 calories, it’s not a huge bar. But has 12 grams of protein. It was like a fun candy bar with a chocolate shell coating and rich, chocolate coconut filling. It will held me over during the appointment, but I was ready for another snack after the appointment and these aren’t cheap, something I’d consider mostly when traveling. I confess that I have a cabinet full of vegan recipe books I don’t use enough, making time to browse through them for recipe planning has been an issue lately. 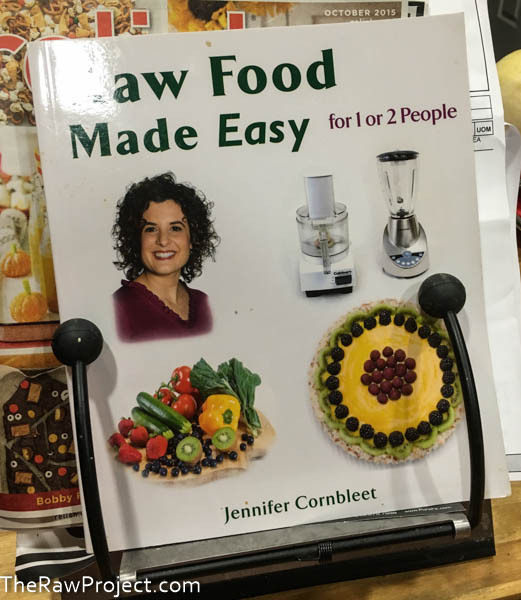 But I did pull out a classic last night and probably my first raw food recipe book I got over 6 years ago – Raw Food Made Easy by Jennifer Cornbleet. Mine is even the original edition with the old cover, food stains, and chicken scratched notes on recipes. I grabbed it to create the simple raw marinara sauce recipe in it for steamed spaghetti squash. Only I skipped adding olive oil as the recipe called for and used very ripe fresh roma tomatoes in place of the sundried tomatoes since I didn’t have any and threw in miso paste in place of the salt. It came out good and worked with the spaghetti squash really well. 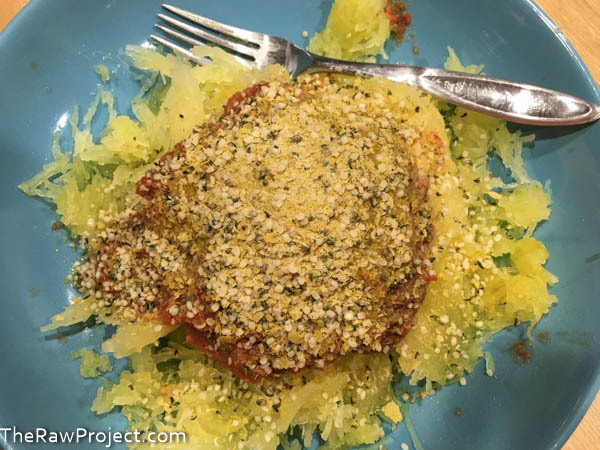 Especially topped with hemp seed “parmesan”. It’s still one of my favorite books with a lot of fast and basic recipes that are easily modifiable, such as the cashew dressing recipes can be swapped with hemp seeds, etc. Spaghetti squash is still one of Miko’s favorite foods, so I had to share at the dinner table. But I guess I’ll get on with this week’s list! Aquafaba, or chickpea water, is the winning vegan egg substitute for baking. Dr. Ellsworth Wareham is such an inspirational vegan to me and thriving past 100. How about raw vegan apple cider doughnuts for a fall treat? Or these raw vegan pumpkin bars? This article breaks down how to control overeating. Mayim Bialik tackles the tricky topic of gun violence and mental health well. Take a look at how Scoot Jurek fueled up for the Appalachian Trail. Finally, Awesome Bill Gates is helping to fund another plant based food startup. Everything looks great! And that pic of Miko OMG so cute! He looks so human there! Sitting up to the table! teehee! Can’t wait to see your pumpkin haul! That pizza, btw, is MASSIVE! Looks so good! Thanks and Miko is such a fan of spaghetti squash, loves it when I put it in his dinner bowl! That Square Bar looks so yummy! They were and would make a good traveling snack! I always order a veggie pizza without cheese because there are few places in Illinois that use vegan cheese. It’s actually very good without cheese. :) And aquafaba is amazing, I use it in a lot of recipes. Agreed on vegan pizza, without and loaded with veggies feels more natural. 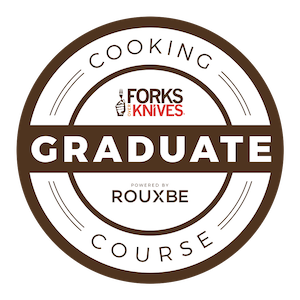 And I have yet to work with aquafaba, but need to soon! 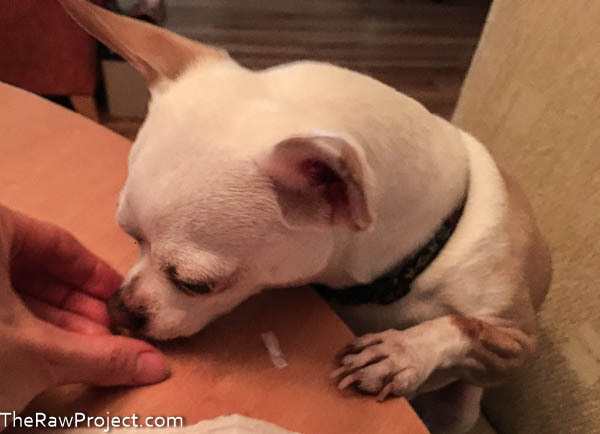 Awesome, our pups go nuts for it! I still can’t get over your dog eating spaghetti squash! So funny. I’m totally on the pumpkin bandwagon to. I Just love them. Especially those seeds which I am addicted too. We bought some huge pumpkins for a buck each, but we were super lucky! Can’t wait to carve. And I ordered my Halloween costume on Amazon last night. And my husbands. He is going to KILL me when he sees what he has to wear. Oh well. I’m obsessed with pumpkins like a kid, lol. I bought 5, but could have easily grabbed 10+! Haha on the Halloween costume, can’t wait to see it!